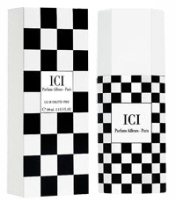 Ici (shown) is a fruity floral for "today's beautiful heroines". It was created by perfumer Michel Almairac and includes notes of apple, raspberry, jasmine, sandalwood, white musk and marine amber. Encore is a musky fruity floral, also by Michel Almairac. Encore "offers a getaway to fun and emotion-filled places" and features pomelo, apricot, cedar, lily of the valley, musk and amber. Ailleurs "is the men's fragrance for a modern explorer", and was developed by perfumer Henri Bergia. It is a citrusy green woody marine scent with notes of lemon, cypress, jasmine, cyclamen, patchouli and amber. I know it's part of the job description, but seriously: don't you think perfumers die a little inside when they discover that they are required to crank out yet another fruity floral? The men's scent sounds a little worrisome, too (another marine scent–hooray), since it sounds as if it's trying to belong to four fragrance families at once, but the floral notes in the middle are intriguing. Cyclamen? I'll give it a shot if I ever see it. LOL — I know it would make me pretty weary! Don't know if these will be widely distributed in the US or not — I've never seen Salvador Dali or Morgan in person, only at the online discounters. Gosh, really? A boutique up the street from me has a half dozen of the Dalis, including the magisterial Salvador Dali and the blissfully sweet Angel knockoff Dalissime, and you can actually buy Morgan de Toi scents at the local supermarket–no kidding. And I live in a dumpy little cityette in eastern Canada. I have never seen a Salvador Dali scent in person even once. Maybe I need to check Perfumania or one of those chain perfume stores? I tend to whizz by those.